GAS provide a lookup page to identify aircraft from a Mode S code. Airframes.org is an alternative web site which provides registration, ModeS code and Airline code lookup facilities. SBS Populate is designed to update aircraft record details in the SQB database. It can add registration, type, operator and c/n details - and the Logo code if known. SBSPopulate can import records into the SQB database individually, from a CSV file or from a user defined range of ModeS codes. Active Display (AD) is a session viewer/database population tool which evolved from SBS Populate. Active Display - The main display. This is a viewer/editor for the current Session data in SBS. It includes additional data columns for Route, Radio Callsign and Sub Operator. Records are automatically populated with data from the GAS database. Aircraft Display - Aircraft display is a viewer/editor for the Aircraft records in the SBS database. AD functions - include autopopulation, alerts (on callsign,code, reg or type), full edit facilities, picture lookup/display, a database search, log creation and airport/airline/route databases. Active Display Lite (ADL) is a freeware version of Active Display and is a replacement for SBS Populate. 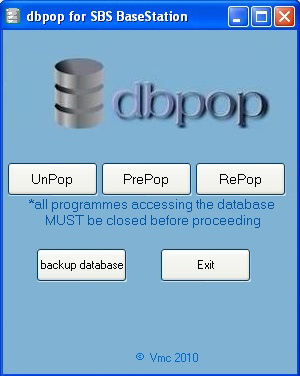 It includes most of the tools found in SBSPopulate plus a wealth of additional tools and features. The main display is a viewer for the current Session data in SBS. Records that are automatically populated with data from the GAS database are highlighted in green. 1. Autopopulation, filters for populated or unknown records and an add/delete/update record facility. 3. Database backup and restore utility. 4. Add-on support for easy installation of country flag sets, operator logos, waypoints, outlines and coastlines. 5. A METAR viewer supporting raw or decoded METAR displays for most airfields worldwide. PrePop will pre-add, by user-selected region(s), hex codes for factory-new and about to be re-registered aircraft, so they're already populated in your database on first reception. It also includes a 'new' logo to identify these aircraft on your BaseStation display.